Gilbert loves to throw parties for his family and friends. Gatherings can be quite large, sometimes 30 plus guests. As you can imagine, squeezing enough fresh limes to make that many Margaritas (90 plus drinks) is definitely not an option. Gilbert created this special Margarita recipe to service large groups. The following recipe may need to be tweaked for use in Mexico, depending upon the ingredients available. The measurements below make ONE batch, about 52 ounces. It is recommended that you make several batches ahead of time, about an hour before your party guests arrive. Cans of frozen Minute Maid Premium Limeade – Do not use off-brands or the Margaritas will not taste the same! Empty one can of frozen Minute Maid Limeade into the mixer. Use the empty limeade can as the “measuring cup” for the rest of the ingredients. Add one cup of purified water. Add one cup tequila. 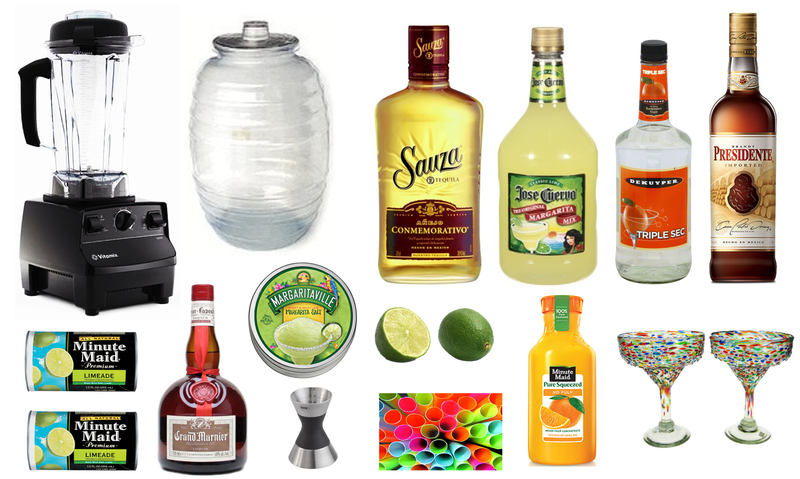 Add one cup Jose Cuervo Margarita Mix. Add 1/3 cup triple sec. Add 1 ounce of orange juice. Add one ounce of Presidente Brandy. Blend these ingredients at a very low speed (at the lowest speed possible). Pour mixture into a large container for brief storage. Repeat the process for the next batch. Woo-hoo! The Margaritas are prepped. Let the festivities begin! For Margaritas on the rocks: Pour Margarita mixture into salt-rimmed glasses with ice. Top with Grand Marnier. Garnish with a slice of lime and a straw. For blended Margaritas: Put ice in the blender. Pour the Margarita mix into the blender until the liquid is slightly above the ice. Blend. Pour Margaritas into salt-rimmed glasses. Top with Grand Marnier. Garnish with a slice of lime and a straw. Gilbert’s Famous Margarita Recipe tastes best when poured into fun and colorful Margarita glasses. The beautiful multi-colored Margarita glasses shown in the photo box above can be purchased at Mundo de Cristal in downtown Puerto Vallarta, Mexico. For the exact location of Mundo de Cristal, refer to the Romantic Zone Map where the store is marked with a light-pink square. When you arrive at the store be sure to tell them that Gilbert from visit-vallarta.com sent you!